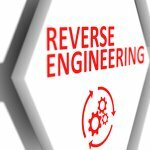 Reverse engineering can be a great tool to learn something new. Whether you are analyzing an object (a device, electric component, a software program etc.) or trying to rebuild it, you can learn about them simply by taking them apart and putting them back together again. That, to put it briefly, is the concept behind reverse-engineering, to break something in order to analyze and understand it. This technique is not specific to computer science only, instead, it can be used any time to understand any process or a project. Reverse engineering was originally applied to hardware only, which presently, is applied to software and database as well. You can also use it as a way to make new / low cost solutions and for making any software work more effectively. Let’s see how reverse engineering is being used in different domains. Manufactured products are taken apart to learn and understand how they work mechanically and what is the purpose of certain parts in the functionality of the whole product. This can help in creating a better version of that product with less errors to work more accurately than the one designed originally. The purpose of reverse engineering in programming is to break down the code, in an attempt to fix errors or bugs which are preventing the software to work properly. Also, to find out, how various functions in the code are built, what is their purpose and how each relates to other functions in the code. Software developers often use reverse engineering to improve their own code or to improve interoperability between programs. Several software suites have application programming interfaces known as APIs that allow interoperability. But most APIs are so poorly written that third-party developers have no choice but to reverse engineer the programs just to ensure compatibility with their software. The concept of artificial intelligence is based on a human brain. Researchers and neuroscientists, reverse engineered brain’s neurons and created brain like artificial neural networks which they, then applied to machines to perform tasks exactly like humans do. Developing algorithms inspired by the brain, engineers have improved the ability of self-driving cars to process their environment more efficiently. Similarly, facial recognition in mobile phone and Facebook are examples of the functions based on AI. Companies that develop security software, reverse engineer viruses and other malware to strengthen their defense mechanism. By breaking down a piece of malware and studying it, these companies can develop tools to combat the techniques used by malware developers. This can help them to develop a more reliable security system that is difficult to penetrate. The objective of reverse engineering is always the same i.e. to analyze and learn detailed information about something that already exists. However, the tools required to perform these analyses can vary greatly, depending on the type of object or software being studied.